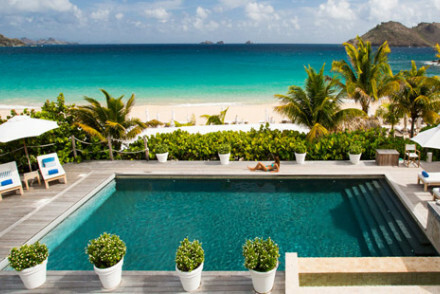 Technically 'St-Barthélemy', St-Barts is probably the Caribbean's most sophisticated island. 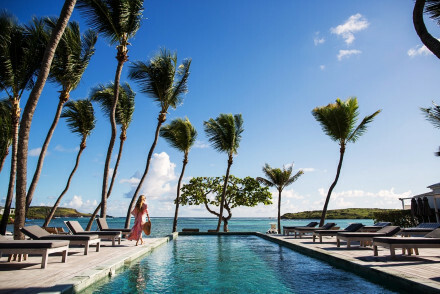 Both the beauty and the atmosphere draw the rich, famous and beautiful, so the best places to stay on St-Barts range from opulent to majestic. But out of season, there are some excellent value deals to be discovered. A beautiful volcanic outcrop in the Leeward Island group, St-Barts is less French West Indies than metropolitan France. Though of course in a daydream setting of turquoise waters, white sand, windswept granite cliffs and sprouts of bright green. Around 200,000 people visit this tiny island each year - sold on the beauty of the place. But, St-Barts actually has a fascinating history. Discovered by Columbus it was settled by the French, then briefly sold to Sweden, before being bought back by the French. This little pocket of Swedishness is quite apparent in the architecture, and certainly adds to the unique flavour of St-Barts. Gustavia is St-Barts' pretty capital. Its smart beach bars and restaurants attract an affluent crowd and it's full of mega-yachts at Christmas and New Year - making it great for people watching - and there are also some great shopping spots. Gustavia is where you'll find the majority of the excellent small hotels. You don't have to be wealthy to enjoy St-Barts though, as the beaches are all public and easily accessible. Hike half an hour away from the main road until you hit the wonderfully secluded Colombier Beach. This lovely spot offers stunning scenery, crystal clear water, lots of privacy and there are a variety of shady spots all around. Plus, this is a great area to head off snorkelling. St. Barth Municipal Museum details historical life on the island with a wide range of artefacts, photos and documents. The Toiny Coast is a great hike with rocky cliffs, natural pools and wonderful views. Be warned though, it may be a bit too challenging for young children. 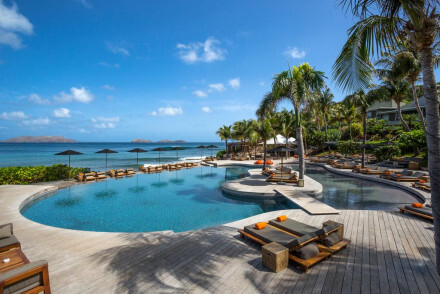 The Hotel Guru's selection of the best places to stay in St-Barts is mainly located around the bay of St Jean and on the Eastern side of the island. Whilst none are exactly cheap, they reflect the going rate on this smart island. 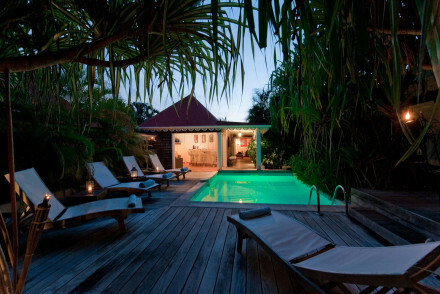 Le Toiny is a selection of colonial style villas overlooking the ocean in a secluded spot on the island's eastern coast. The decor is contemporary, with plenty of terraces and outdoor dining to take advantage of the spectacular views. Le Sereno is a stunning beach hotel overlooking spectacular Grand Cul de Sac. The design is simplicity at its best by Christian Liaigre; white washed walls and dark wood in a happy marriage of Caribbean and cool. Direct beach access and an excellent seafood restaurant. Very sleek, and secluded. 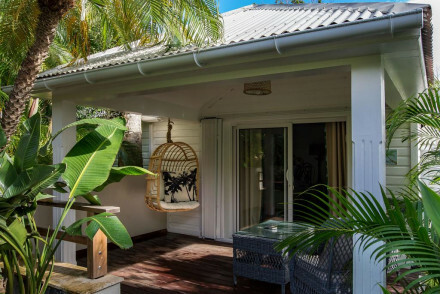 Emeraude Plage, overlooking the Baie de St-Jean, is a stylishly low-key property, set in bougainvillea and hibiscus filled gardens. Superb restaurant, great beach bar and direct access to the beach. Unfussy, but perfect. Hotel Villa Marie is a luxurious spot offering boutique, independent villas and suites with bright colours and stunning vistas. Tuck into splendid French cuisine at the restaurant and spend your days exploring the nearby beaches. Tom Beach is a 12 room, boutique hotel right on the beach at the Baie de St-Jean. The decor is modern and they make as much of the perfect views as they can. Buzzy and fun, there's plenty of watersports to try and lots to do at all times of the day and night. Isle de France is an elegant white and blue hotel right on the white, sandy beach, nestled in amongst banana trees and bougainvillea. Very French and very stylish. Villa Lodge Quatre Epices offers just four chic villas, overlooking beautiful Grand Cul de Sac Lagoon. The decor is modern, with plenty of brushed steel and concrete. Self-catering and plenty of do in the area. Salines Garden Cottages offers individual cottages set amidst lovely gardens. The accommodation is traditional chic in design, featuring four poster beds, white linens and the odd splash of bright colours. Plus, you're just a short distance away from a number of stunning beaches! 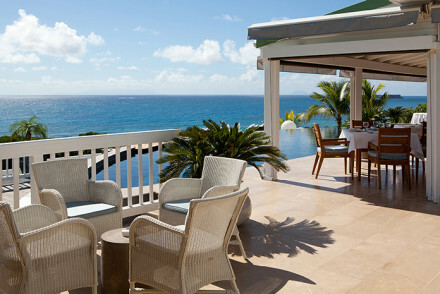 Guanahani is the perfect family beach resort destination. It's built above a spit, so there are back-to-back beaches, with calm turquoise water on one side and slightly rougher seas on the other. And plenty of palm trees. Elegant but colourful there's also an enormous pool and there are kid's clubs for both younger and older children. 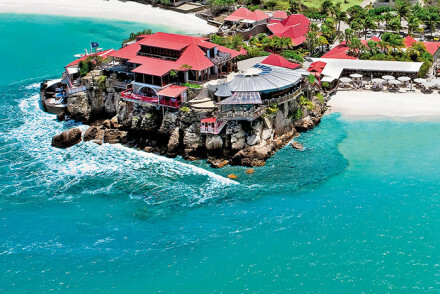 At the other end of the price scale is Eden Rock a five star resort overlooking coral reefs. Villas have full kitchens and enormous living spaces - and some have jacuzzi terraces or private pools. There are a number of family-friendly restaurant choices and every opulent spa service you can imagine. If you think that a self-catering option would best suit your needs then browse through the options available with our partner, booking.com. 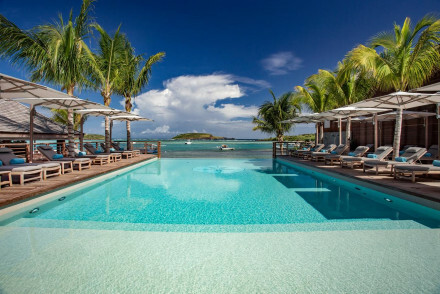 St Barts is beautiful year round, with only a 3ºC difference in temperature between the winter and the summer. That said, December through May is the dry season, whilst June to November is the rainy season. Also be warned that, as well as rainstorms, hurricanes can occur at any time on the island (though the most likely time is September). Visitors can fly into St Barts Airport (SBH), aka Gustaf III Airport, located in the village of Saint Jean. 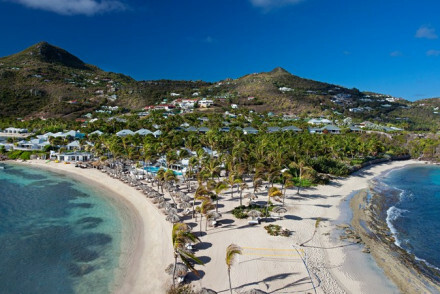 If you're coming from the UK then Air France fly from Heathrow to St Barts via St Martin, or you could fly with British Airways to Antigua and then go on to St Barts with Liat. 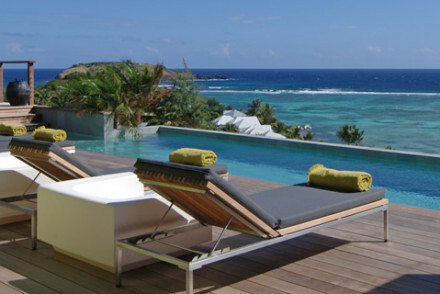 Browse through our list of all the best places to stay on St-Barts. A charming hotel comprising individually styled cottages set amid a tranquil garden, close to the beach. Cottages have a traditional feel and are white washed throughout with solid four poster beds and bright artefacts from the owner's travels. A little haven made for completely unwinding. Beach Life - An ideal spot, just steps from some of the finest beaches in the world. Surfing - Excellent conditions for surfing and the owners will be able to point you in the right direction for the best waves. Sailing - Hire either sailing boats, catamarans or motorboats for a whole or half-day, with or without a skipper. Stylish beachfront property. Decor is low-key with white washed walls, contemporary furniture, large bathrooms and private sundecks. Outdoor pool, direct beach access and Bougainvillea and Hibiscus filled gardens. Fresh, excellent local cuisine and beachfront bar. Modern, tranquil and spacious. Boutique hotel on the beach. Modern rooms have four poster beds, granite bathrooms and high ceilings. Outdoor pool, terrace, art gallery and direct beach access. Excellent contemporary menu in the popular restaurant. Lively and laid-back, ideal for younger couples. Colourful villas on a hillside above Grand Cul de Sac beach. The villas are themed on Caribbean spices, and decor is modern with polished concrete, kitsch furnishings and full kitchens. Outdoor pool and sun terrace. Chic, cool and great value. 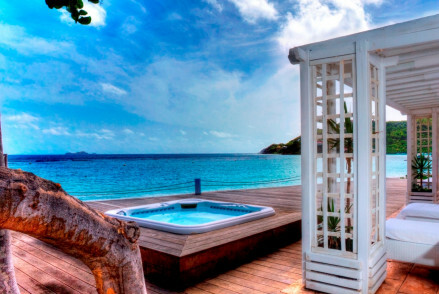 The luxurious Hotel Villa Marie, Gustavia, St Barth offers boutique, independent villas and suites featuring bright colours and gorgeous views. Treat yourself to elegant French cuisine at the restaurant before retiring with a rum and cigar from the bar! An utterly spoiling coastal spot. Total relaxation - Lovely accommodation, a serene location and spa facilities-what more could you ask for? 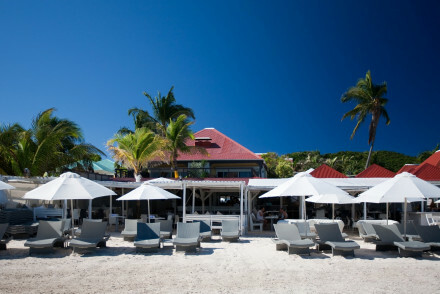 Hotel Christopher enjoys a superb location on the beach in Saint Barth, just a few miles from the airport. This 5* resort offers luxurious accommodation furnished in light hues and boasting plenty of natural light. Enjoy divine meals at their on site restaurants! A simply stunning coastal retreat. Sailing - Hire a boat and sail all around the island - the most beautiful way to get to know the place! Stunning hotel on the beach at Grand Cul de Sac. Designer rooms have white-washed walls, polished wood furnishings and contemporary furniture. Outdoor pool, gardens, spa and direct beach access. Excellent restaurant and cool bar. Slick, exclusive and secluded. Sublime hotel on the beach. Elegant rooms are styled in white and blues with modern artworks and opulent bathrooms. Outdoor pool, gardens, tennis courts, gym and spa. Sophisticated French menus, chic bar. Nestled amongst banana plants and bougainvillea and white sands, ideal for honeymoons. Colonial style villas overlooking the ocean. Contemporary rooms have dark wood floors, four poster beds, patio hammock and private pool. Gardens, gym and spa. Sublime French cuisine and romantic bar. Secluded, chic and boutique. Colourful beachfront hotel. The elegant rooms have creamy mosaic bathrooms, contemporary furniture and colonial style architecture. Enormous outdoor pool, beach access, spa and gym. Excellent seafood cuisine and breezy bar. Luxurious whilst remaining friendly and relaxed. A chic resort set on a stunning crescent-shaped beach, refined yet fresh, with a timeless elegance. Bright rooms have an air of understated luxury with plenty of light, natural materials and thoughtfully added technology. Feast on French inspired cuisine and spend days unwinding in the spa. Five-star resort overlooking coral reefs. Contemporary rooms and villas have mahogany furniture, opulent bathrooms and silk extras. Some with jacuzzi terraces or private pools. Outdoor pools, gardens, gym, spa. Superb continental menu, bar with a view. Luxurious and very chic.